I first came across this story via a YouTube video of a Scottish gran, Janice Clark, reading the book amid gales of uncontrollable laughter to her slightly bemused baby grandson. Her uncontrollable delight in the language and humour of the story is so infectious that I found myself cackling along too. The warm tone of her Scottish brogue added magic to the story of a journey where we are walking the road and meeting with Wonky Donkey and discovering various aspects of his character in a riot of delightful cumulative wordplay. I am wary of so-called internet viral sensations but something about this clip was so authentic and enchanting that I found myself sharing it with friends and bought myself a copy of the book without any pretence that it was to share with children, teachers or to review. This video was not the product of an ‘influencer’ at work or a cynical ploy to create a buzz in the marketing of a celebrity author’s book. It was pleasing to note that The Wonky Donkey overtook ‘Fear: Trump in the White House’ on the Barnes and Noble bestseller list. 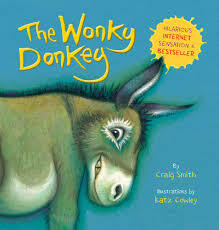 The Wonky Donkey is written by New Zealander Craig Smith and illustrated by Katz Cowley and it was first published in 2009 with a modest print run. Thanks to Janice’s rendition sales are going through the roof. To my precious Mum, Dad and aunt Wren ... your love support and inspiration fuels my creative journey and makes all of me smile and sing. With big-fat gratitude for keeping me tuned to the magic and humour of life. Sharing what delights you and makes you laugh is life enhancing and helps babies and children to tune into the magic and humour of life. It highlights the importance of sharing stories. There is even a song! We would all crack up with gales of laughter to hear our teacher say the rude word - knickers. I can still recall the delight on her face too as we begged her time and time again to read the poem to us. That Christmas I asked for a book of A.A. Milne’s poetry for Christmas so I could read the poem by myself. Here’s hoping that this book with its humour, ‘rude’ bits and wordplay will inspire more people of all ages to read aloud to children, share the humour and magic of life, visit their public libraries and to foster a lifelong love of reading.